What are Types of Robots? 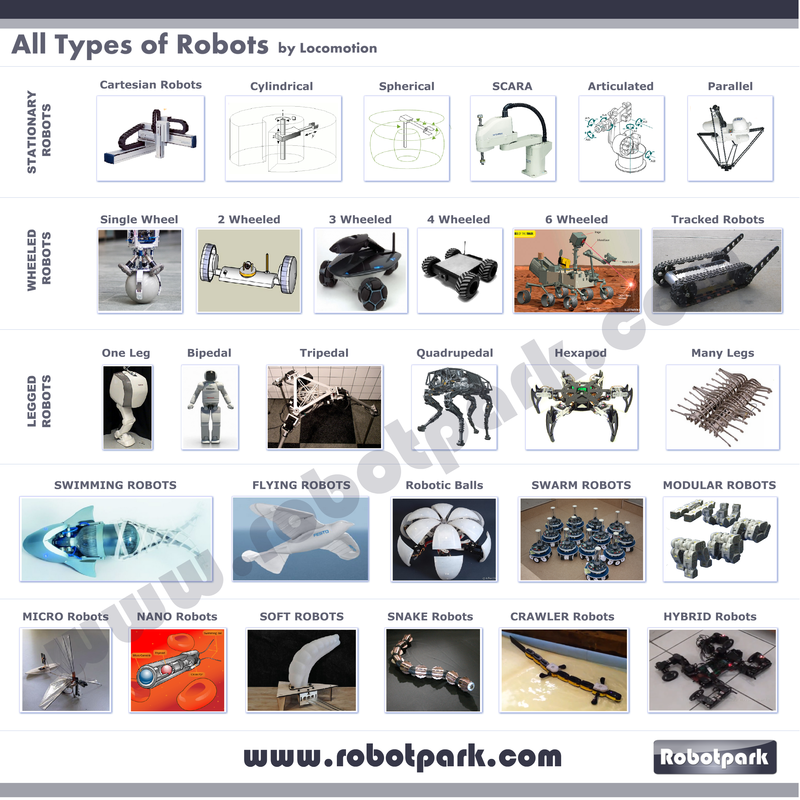 Here are the types of robots by locomotion systems. We will examine these types in detail. Please Click on the image for a larger picture. Stationary robots are robots those work without chaning their positions. Referring the robot as “stationary” does not mean that the robot actually is not moving. What “stationary” means is the base of the robot does not move during operation. These kind of robots generally manipulate their environment by controlling the position and orientation of an end-effector. Stationary robot category includes robotic arms, catesian robots, cylinderical robots, spherical robots, SCARA robots and parallel robots. Wheeled robots are robots which change their positions with the help of their wheels. Wheeled motion for a robot can be achieved easily in mechanical terms and its cost is pretty low. Additionally control of wheeled movement is generally easier. These reasons make wheeled robots one of the most frequently seen robots. Single wheeled robots, mobile ball robots, two-wheeled robots, three-wheeled robots, four-wheeled robots, multi-wheeled robots and tracked robots are examples of wheeled robots. Legged robots are mobile robots, similar to wheeled robots, but their locomotion methods are more sophisticated and complicated compared to their wheeled counterparts. As their name suggests they use their legs to control their locomotion and they perform much better than wheeled robots on uneven terrain. Despite the cost and complexity of production is high for these robots their advantages on uneven terrain makes these robots indispensable for most applications. One-legged robots, two-legged robots, three-legged robots, four-legged robots, six-legged robots and multi-legged robots are examples of this robot class. Swimming robots are robots which move underwater. These robots are generally inspired by fish and they use their fin-like actuators to maneuver in water. Flying robots are robots that float and maneuver on air using their plane-like or bird/insect-like wings, propellers or balloons. Examples of these robots are airplane robots, bird/insect inspired wing flapping robots, proppeller based multicopters and balloon roobots. Swarm robots are robotic systems which consist of multiple small robots. These robots structurally does not create a single united robot, but operates as their robot modules operate cooperatively. Although similar to modular robotic systems, elements of swarm robots have much less functionality and herd configurations does not create new robots. Similar to swarm robots, modular robotic systems also have multiple robots in their configurations. Modules of these systems are more functional compared to a robotic herd. For example a single module of a modular robotic system can have self-mobility and it can operate alone. The power of modular robotics comes from its versatility in its configurations. Modules of a modular robotic system can create very different configurations and the robots created this way can have very distinct abilities. By definiton micro robots term is used to specify both robots that have dimensions on micrometer scale and robots that can operate on micrometer resolution. Therefore both possibly very big stationary robots that can manipulate their environment on a micrometer scale and small robots that are actually measured by micrometers are called micro motors. Similar to micro robots nano robots also defined a bit vaguely. The term nano robot both defines very small robots which have nano meter scaled dimensions and robots those can manipulate their environment with a nano meter scale resolution regardless of their actual sizes. Soft/elastic robots, are new introductions to robotics. These robots are generally bio-inspired. Most applications are inspired from squids or inchworms both structurally and functionally.